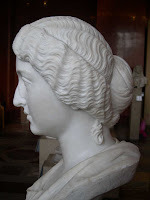 The most original fields of Roman Sculpture are portrait and historical relief. Anyway, this was not an obstacle to be combined with Greek and Hellenistic influences. Greek influence was noticeable at the end of the Republic (2nd- 1st centuries BC). The same as in architecture, the models influenced Roman artists. The admiration of the upper classes towards Hellenistic plastic and the fact that many Greek sculptors were working in Rome supported this influence. Greek plastic was considered as a model of beauty and copies proliferated. Thanks to it was possible to know classical artists’ work. 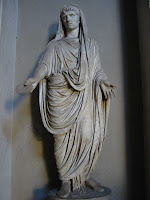 It is the most characteristic element of Roman sculpture, the distinctive one. For the Romans, sculpture depicts realism and the sculptor’s mission is not to depict just beauty but to reproduce nature, reality. In front of the abstraction of perfect characters, Romans preferred the depiction of real people, with their real features, even if there were not nice. Artists did not aim at showing their technical mastery but to honour the authorities. This explains the fact of the artists being anonymous. Roman realism has its root in several points. The first of them is the fidelity pursued by the Etrurian in their funerary portraits and the tombs painting. This led them to realise masks of the dead people that were the model for future images. These busts were kept in the houses to be honoured. Other element is the practical sense of Romans that encouraged them to depict things as they are. The interest for bearing witness of the things that had happened pushed an interest for history and narration that imbued plastic arts. 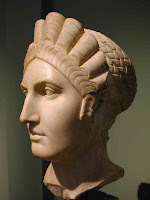 Finally, individual portrait was widely developed during Hellenism and this was a model for the Romans. Romans cultivated all kind of portraits: bust, half body, full body, head, and any positions: standing, sitting, and equestrian. This last one was reserved for emperors. 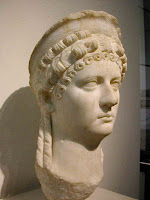 The portrayed characters are always people important in Roman society, mainly emperors, who could be depicted in different ways. The materials, disposition, folders of the clothes and other elements evidence Greek influence but what is original is the extraordinary realism of the portrayed people, maintaining their hard character or their expression in addition to the psychological elements. Until the 2nd century there were polychrome effect but them they changed for monochromic depictions and the eyes started having volume to depict the pupil. The development of Roman portraiture is characterized by a stylistic cycle that alternately emphasized realistic or idealizing elements. Each stage of Roman portraiture can be described as alternately "veristic" or "classicizing," as each imperial dynasty sought to emphasize certain aspects of representation in an effort to legitimize their authority or align themselves with revered predecessors. These stylistic stages played off of one another while pushing the medium toward future artistic innovations. Portraits were made just to the neck. Giving emphasis to the head. After that they continued with the bust. They were made of bronze or stone and polychrome. A majority of the artists were Greek. Portrayed characters are seldom private or public, showing gravity and serenity. Faces are energetic, strong and determined, even when public portraits present a certain idealization to underline the virtues of the subject. The most highly valued traits included a devotion to public service and military powers, and so Republican citizens sought to project these ideals through their representation in portraiture. Public officials commissioned portrait busts that reflected every wrinkle and imperfection of the skin, and heroic, full-length statues often composed of generic bodies onto which realistic, called "veristic” portrait heads were attached. The overall effect of this style gave Republican ideals physical form and presented an image that the sitter wanted to express. Since Rome became an Empire sculpture suffered a transformation and so did portrait. Classical Greek idealism was more influential. Official portrait is idealized, trying to show the grandeur of the character, mainly divine, even without losing their own physical features or character expression. The prototype was established during August’s times. The emperor appeared as a god, his hair falling in an irregular way on his forehead, the face always shaved. With the Flavians and on (2nd century) realism appeared again, hair had more volume, they had beard and chiaroscuro effects were used. There are monumental portraits, with great variety: Thoracata, as emperor or victorious general (Augusto of Prima Porta), Togatae wearing as a civilian or with the classical toga; apotheosis, with a divinised image, almost naked and crowned with laurel; equestrian, riding a horse (Marco Aurelio). During this period feminine portraits were common too, with especial attention given to hairstyles and a realistic depiction of women. 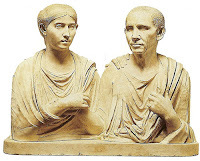 Augustan and Tiberian portrait tradition of classical and idealized features that carried a strong "family" resemblance. 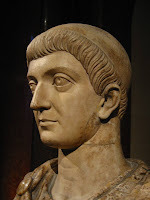 However, during the reign of the emperor Claudius (r. 41–54 A.D.), a shift in the political atmosphere favored a return to Republican standards and so also influenced artistic styles. 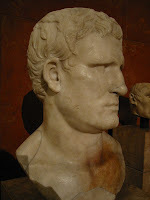 Portraits of Claudius reflect his increasing age and strongly resemble veristic portraits of the Republic. This trend toward realism eventually led to the characteristic styles of the second imperial dynasty: the Flavians. With the Flavians portraiture characterized by a return to a veristic representation that emphasized their military strengths. 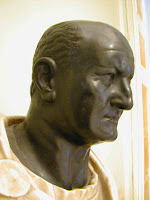 Portraits of Vespasian, the founder of the Flavian dynasty, similarly show him in an unidealized manner. 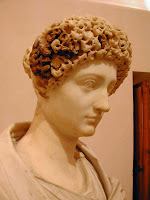 During the Flavian era, sculptors also made remarkable advancements in technique that included a revolutionary use of the drill, and female portraiture of the period is renowned for its elaborate corkscrew hairstyles. With Trajan the cycle continued with his portraits (r. 98–117 A.D.), who wanted to emphasize symbolic connections with Augustus and so adopted an ageless and somewhat idealized portrait type quite different from that of the Flavians. His successor Hadrian, however, went a step further and is noted as being the first emperor to adopt the Greek habit of wearing a beard. 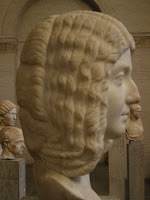 The textual interplay that was developed in the treatment of Flavian women's hairstyles was now more fully explored in male portraiture, and busts of the Hadrianic period are identified by a full head of curly hair as well as the presence of a beard. 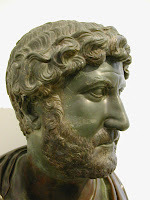 The Antonines modeled their portraits after Hadrian, and emphasized (fictional) familial resemblances to him by having themselves portrayed as never-aging, bearded adults. Continued development in Roman portrait styles was spurred by the philosopher-emperor Marcus Aurelius and his son Commodus (r. 177–92 A.D.), whose portraits feature new levels of psychological expression that reflect changes not only in the emperors' physical state but their mental condition as well. These physical embodiments of personality and emotional expression later reach their fullest realization in the portraits of the Severan emperor Caracalla. 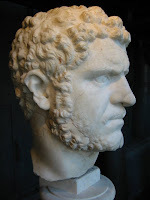 Caracalla is shown with a short, military beard and hairstyle that were stippled across the surface of the marble for a "buzz-cut" effect, also called "negative carving." He is also shown with an intense, almost insane facial expression, which evokes his strong military background and, according to some scholars, reflects his aggressive nature. This portrait type is credited as having a profound effect on imperial portraiture in the turbulent years to follow his reig n, and many of the soldier-emperors of the third century sought to legitimize their rise to power by stylistically aligning themselves with Caracalla. 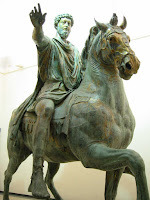 As time went on, these stylized aspects became increasingly prominent, and soon a pronounced attention to geometry and emotional anxiety permeated imperial portrait sculptures, as evident in the bronze statue of Trebonianus Gallus. This increasing dependency on geometric symmetry and abstraction contributed to the highly distinctive portraiture utilized by the Tetrarchy. During this period there was a reaction against classicism. Delicate volume disappeared, facial expression is intensified but simplicity is underlined, at once with hieratic gestures. All sense of proportion and taste for detail disappeared. Dehumanization, monumentality and schematization are the features of the period. The works appear to be archaic, aspect in which they linked to Bizantian models. The most important example is Constantine the Great. It symbolised the aim of depicting Roman immortality. The last tradition of presenting the exploits of the warriors and the desire of depicting them in stone reached its last expression. It is propagandistic. It is present in several buildings, subordinated to architecture (columns, arches, and sarcophagus). They used pictorial effects such as perspective to create effects of deepness. Characters are located in different plans and landscape elements are included. It developed mainly during the Empire. 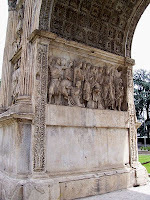 The most important examples are Ara Pacis made to honour Augusto and his family. Tito’s Arch it is definitely propagandistic; Traian Column with the whole surface covered as pursued by horror vacuii, deepness, perspective and landscape are present. Other field for relief sculpture were the sarcophagus, that could vary from simple medallions to full scenes associated with the buried character. Christians used a more simple model, with immortality symbols.